Zimbabwe is home to the iconic Victoria Falls and a wealth of fine wilderness areas to travel to for your safari vacation. Zimbabwe's bewitching vacation offerings range from authentic wilderness areas like Mana Pools to the transcendent beauty of the illustrious Victoria Falls. 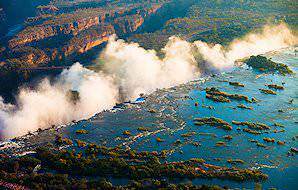 The primary destination in Zimbabwe is the mighty Victoria Falls. This natural wonder and the area that surrounds it offers international visitors a great number of different activities. From the leisurely to the exhilarating, you are sure to find your visit to the area a most entertaining endeavor. Zimbabwe lies south of this grand natural spectacle. Mana Pools National Park is one of Africa's most unspoilt wilderness areas. In addition to the mighty Vic Falls and Mana Pools, Zimbabwe is home to a treasure trove of other national parks and historic attractions. Those traveling to this Southern African country can revel in unforgettable wildlife sightings, grand natural scenery and a rich history stretching back as far as the bronze age. Hwange is the largest of Zimbabwe's national parks. It is located in the northwestern part of the country and borders the neighboring country of Botswana. 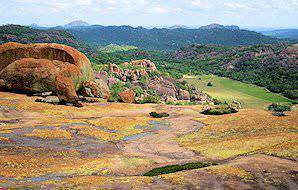 Initially utilized as a hunting ground by the Ndebele King Mzilikazi, the area was proclaimed a national park in 1929. Great Zimbabwe is the ruins of an ancient city located in the southeastern hills of Zimbabwe, near the town of Masvingo. 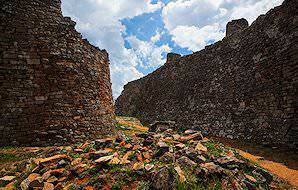 It is believed to have served as the capital for the Kingdom of Great Zimbabwe during the late Iron Age era. Covering an area of 722 hectares (1780 acres), these ruins have been declared a UNESCO World Heritage Site. 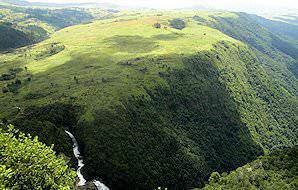 Located in Zimbabwe's eastern highlands, Nyanga National Park is a scenic delight with rolling green hills criss-crossed by perennial streams and rivers. The altitude of the park ranges from around 1 800 to just under 2 600m, with cool mountain air and an abundance of large antelope species that include sable and eland. A sanctuary for both the white as well as the rare black rhino, Matobo National Park covers an area of just under 45 000 hectares (about 110 000 acres) in the Matobo Hills, with its magnificent granite outcrops and domes. The park has the distinction of being the burial site of Cecil John Rhodes. 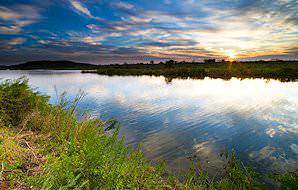 Gonarezhou is a large national park set in the southeastern lowveld of Zimbabwe. The name means 'place of many elephants' in the local tongue. It is a place of great beauty which forms part of the Great Limpopo Transfrontier Park that also includes the Kruger Park in South Africa and Gaza in Mozambique, together forming one of Africa's largest conservation areas. Kariba is one of the world's largest man-made lakes, created in the Zambezi River between the countries of Zimbabwe and Zambia. It is considered one of the finest places in Africa to pursue the tiger fish, legendary amongst the world's freshwater fighting fish. It is also an ideal destination for a house boat vacation in area of stunning natural beauty. Zimbabwe's eastern highlands are a mountain range in the east of the country that forms one of Africa's four distinct physiographic divisions. These very sparsely populated highlands are rich in animal and bird life inhabiting an area of vast, grassland-covered hills with a cool climate and high annual rainfall. These national parks have been declared a UNESCO World Heritage Site, with the primary purpose of conserving the area surrounding the mighty Victoria Falls for future generations. 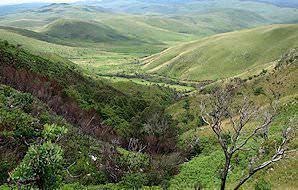 Chiamanimani National Park conserves an area of rugged mountainous terrain on the Zimbabwean border with Mozambique. Virginal forest and a number of different mammal species make this park a nature lover's delight. Infrastructure and facilities in the area are limited. This park is recommended for die hard nature lovers intent on venturing off the beaten track. Vacations in Zimbabwe typically range from awe-inspiring visits to the Victoria Falls to safari experiences in true wilderness areas. Our existing itineraries have been carefully attuned for discerning travelers. We will customize any safari, tour or honeymoon to meet your needs. Though mired in political turmoil and economic crises for many years, Zimbabwe’s tourism hot spots remain consistently popular, particularly the Victoria Falls. Seasoned travelers consider the views from the Zimbabwean flank of the Zambezi River to be superior, as a more panoramic view of the Falls is visible from this angle. Wilderness areas like Mana Pools and Hwange National Park are both barely touched by development and yet established enough to provide the luxury safari experiences that capture the imagination of those who dream of traveling to Africa. The results are authentic safaris over breathtakingly wild landscapes, with guests wanting for naught. Adrenalin rush activities are plentiful in Zimbabwe, particularly around the Victoria Falls. Bungee jump from the Victoria Falls Bridge, swing for 95m across a gorge 120m high, observe the Falls from a helicopter, brave the Batoka Gorge on a white water rafting expedition, hurtle along the world's longest zip-line, ride atop an elephant - the opportunities are exhilarating, to say the least. The hotels and lodges may not be considered 'cheap' by most standards, but they tend to be more affordable than the pricey palaces of Zambia and Botswana, where mid-range is rarely an option. All these countries typically charge in US Dollar for their accommodations and activities, so they tend to be pricier to visit than Namibia and South Africa. Victoria Falls is a tourism-driven town on the western end of the famous Victoria Falls, with daily commercial flights scheduled between Johannesburg and the airport some 18km south of the town. Harare is the capital city of Zimbabwe and the country’s political, financial and commercial heart. Harare International is the largest airport in the country, with daily direct flights to and from Johannesburg. It is the ideal access point for those traveling to Mana Pools, as it offers the nearest commercial airport to this beautiful wilderness. In Zimbabwe, the rains typically arrive in December and continue into January, February and March. The further north you venture, the earlier the advent of the precipitation and the later it departs. Zimbabwe's more elevated eastern areas generally enjoy more rainfall than the lower-lying western regions. Around April or May, most of the rain has ceased, leaving behind a lush setting which then starts to dry out. The nighttime temperatures begin to wane. Evenings in June, July and August are considerably cooler, so be sure to pack some warmer items if you plan to be outside on game drives. The days remain clear and warm. In Zimbabwe, this is the beginning of 'peak season'– days are often cloudless and game sightings increase. Into September and October, the temperatures rise once again: Zimbabwe's lower-lying rift valley – Mana Pools – can become uncomfortably hot in October. During this time, you will nevertheless enjoy some fantastic sightings, as the wildlife is forced to concentrate around the limited remaining water sources. November is unpredictable; it can be hot and dry, but can also see the season's first rainfall. Visitors from most Western countries, including much of Europe, the United Kingdom, the United States and Australia, all require visas to enter Zimbabwe, with New Zealand being the rare exception. Middle East and Far East countries are also quite restricted. It is important to check Zimbabwe’s official home affairs website or to contact your nearest embassy before planning your travels. The visa is acquirable and payable at the port of entry or at missions abroad. The current cost is 30USD for a single entry, 45USD for double entry and 55USD for multiple entries. In each case, the visa is 25USD more expensive for UK passport holders. All tourism visas are valid for up to six months. Visa regulations are always subject to change. Malaria is prevalent throughout the entire country of Zimbabwe and anti-malarial medication is thus highly recommended. It is also not recommended to travel to Zimbabwe with small children who are not yet old enough to take anti-malarial medication. 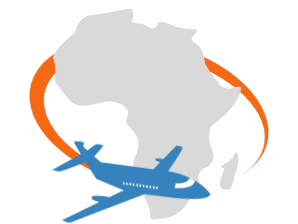 Unless you are traveling via a country with risk of yellow fever, a yellow fever certificate is not required. None of the Southern African countries included in our itineraries fall under yellow fever risk, so this will only be a necessity if you were to travel beyond our care. In addition, be sure to bring along any prescription medication you may be taking and ensure that you are up to date with all routine vaccinations. This includes MMR, DTP, varicella and polio. In more urbanized centers like Victoria Falls, petty crime can be an issue. Be prudent with your valuables. If your hotel or lodge room does not have a personal safe, simply request reception to store your valuables for you. When visiting high density attractions like the Falls or markets, keep alert and remember to be firm with hagglers. Zimbabwe experiences are largely oriented around adventures - from the leisurely and immersive to the hair-raising and unforgettable. Bewitching wildlife and enchanting natural scenery are standard across the board. The famous Victoria Falls bungee jump occurs on the Victoria Falls Bridge that straddles the Zambezi River between the countries of Zimbabwe and Zambia. The plunge is around 111 meters (364 feet) into the Batoka Gorge - a hair-raising adrenalin rush! Bridge sliding and historic bridge tours are also available and offer similarly impressive views. Although you can get closer to the face of the Victoria Falls from the Knife-Edge Bridge in Zambia, three quarters of the Falls lie within Zimbabwe. The 'Main Falls' offer the ideal vantage point if you are visiting during the dry season, as water will still flow over the rim on this end. Many visitors therefore consider the Zimbabwean side as superior. An intimate meeting with the world's largest land mammal is always an unforgettable affair. In the Victoria Falls area in Zimbabwe, you can ride atop these endearing pachyderms through protected wilderness areas, or encounter them up close on an educational visit. Such wildlife experiences are intrinsically memorable. As the roads in the main tourism hubs - like the Victoria Falls - are relatively good, your transfers between accommodations, airports and to activities will typically take the form of either an air-conditioned minibus or coach, depending on the size of your group. These vehicles and their drivers adhere to all safety regulations and official requirements. Should you be traveling further afield, a hardy 4x4 vehicle may be necessary to navigate poorly maintained or dirt roads en route to national parks and wilderness areas. Unless otherwise indicated, your transfers will always be private. Your comfort and safety whilst traveling are paramount to us, and we only work with drivers and companies that comply with the same high standards. 'Sadza' is the Shona name for the ground maize porridge so widely enjoyed across Southern Africa. In Zimbabwe, it is eaten with the right hand, rolled into a ball and dipped into a sauce or gravy, stewed vegetables or sour milk to add flavor. The Zambezi River is one of the finest locations in the world to fight the feisty tigerfish. It therefore stands to reason that the fish is also widely consumed. As it is bonier than tilapia, it is rather cut into small pieces and fried in batter for a snack. Though 'nyama' is the Shona word for meat, nyama also refers to the beef stew typically served with sadza. It is quite simple and more of a relish than a main course, consisting of cubes of beef, onions, tomatoes, garlic, carrots and green beans. 'Chimodho' or 'mupotohayi' is a basic cornmeal bread that is popular in Zimbabwe, though the term is also used to refer to 'bread without a recipe'. It is quite palatable when enjoyed fresh from the oven with butter, jam or marmalade. Is Zimbabwe a safe country to visit? Yes - despite political turmoil, Zimbabwe is a very tourism-friendly country and safe to visit. What power points are used? The power points are 220V, and standard 3-pin square plugs are used. Power cuts are common but most places will have backup generators. What was Zimbabwe known as before independence? Zimbabwe was known as Rhodesia and acquired independence from Great Britain in 1980. South Africa, Botswana, Zambia and Mozambique share borders with Zimbabwe. Will I have access to internet connectivity and / or mobile reception? The town of Victoria Falls tends to be better connected than the more remote wilderness areas, but internet connectivity remains generally unreliable. Is safe drinking water available? Yes - hotels and lodges will always have bottled mineral water on hand. 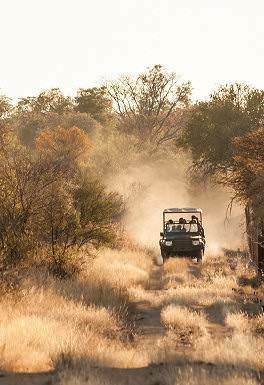 Can I enjoy a Big Five safari in Zimbabwe? Unfortunately, rampant poaching means that rhinos are no longer prevalent in Mana Pools. While rhinos still occur in Hwange and Gonarezhou, they are rarely encountered. Why is the Zimbabwean view of the Victoria Falls considered as superior? The 'main falls' section of the Victoria Falls occurs in Zimbabwe, which means that is has a fine flow even during the dry season, while the Zambian side may be limited to a trickle. Why is US dollar the official currency of Zimbabwe? Zimbabwe's currency, the Zimbabwean Dollar, lost pretty much all value, and while Zimbabwe uses a multi-currency system that includes the South African Rand, British Pound Sterling, etc., the US Dollar holds prominence and preference due to its stability and usefulness in international transactions. Can I go on safari near the Victoria Falls? While a handful of game reserves exist near the Falls, for a true safari experience, it is best to opt for a day trip to Chobe National Park in Botswana. The drive to the park is just over an hour in duration, depending on time spent at border control. Travel to South Africa for a vacation steeped in diverse experiences. Botswana vacations focus on unforgettable game viewing activities. Namibia travel comprises a vast array of desert-oriented adventures. Choose Zambia for your vacation in Africa if you're after an authentic safari. Our vacations in Zimbabwe typically include a visit to the majestic Victoria Falls. Tropical Mozambique is Africa's ultimate beach vacation destination. Zimbabwe has always been a favorite amongst those who travel to Southern Africa, primarily because of the Victoria Falls. Zimbabwe does offer a lot in addition, most notably safaris in some of Africa's finest national parks, like Hwange and Mana Pools where great game concentrations can be viewed in truly wild wilderness areas. The pre-tour advice and booking was excellent. The Victoria Falls and Chobe tour is action-packed and full of interest. The battlefields tour is a must for anyone interested in the war history. Having experienced guides made the tours come alive. All of Zimbabwe's indigenous people are of Bantu origin. The Shona, who form nearly 80% of the population, have a strong, regional clan structure, with six main groupings: Zezuru, based in the highveld around Harare; Manyika and Ndau, in the east of the country; Korekore in the north and northeast, Karanga, in the Midlands; and smaller Rowzi groupings. The majority of Shona live in Mashonaland - the north, central and eastern two-thirds of the country. The Ndebele, descendants of South Africa's Zulus, occupy Matabeleland in two tribal groups - the Ndebele and the Kalanga - in the southern and western parts of the country, centered around Bulawayo. They comprise around 14% of the population. Smaller ethnic groups include the Batonga, which inhabit the area south of the Zambezi around Binga; the Venda, a predominantly South African group focused in the south around Beitbridge; and the Shangaan of Gonarezhou, whose traditional land extends into Mozambique and South Africa. Zimbabwe has many fascinating sites of historical and geological interest, the most major being the Great Zimbabwe Ruins. 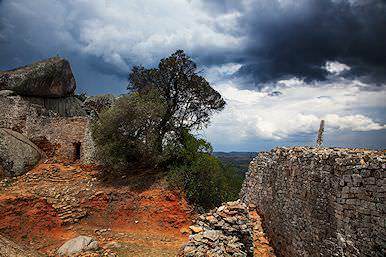 The remarkable ruined city is a national monument that stretches over 722 hectares some 25km southeast of Masvingo. It is the largest stone structure ever built south of the Sahara. Great Zimbabwe was the base for a succession of kings and rulers spanning four centuries. This prestigious history led to the whole country being named after it following independence. The term 'zimbabwe' or 'dzimbahwe' is derived from the Shona words 'dzimba dza mabwe', meaning 'houses of stone', referring not just to the main site but to the hundreds - if not thousands - of similar but smaller sites in this area and further afield. The unique, carved soapstone birds found here have become the country's national symbol. Less than an hour's drive south of Bulawayo, you will find one of Southern Africa's most dramatic rock landscapes. 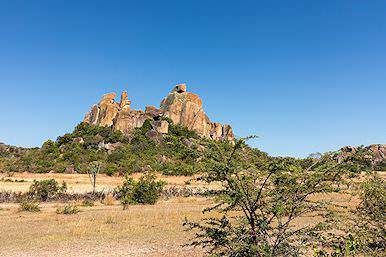 In the Matobo Hills (or 'the Matopos'), granite is the building material and weather the craftsman. The setting is characterized by two distinct rock forms, both the result of the same geological processes. Most dramatic are the balancing rock koppies - huge angular blocks of granite piled on top of and beside one another, forming pillars and stacks. More dramatic in scale, however, are the enormous, bald dwalas or 'whalebacks', grey granite hills rising from the surrounding woodland and criss-crossed with fault lines. The area's hundreds of caves and rock shelters were inhabited and decorated by descendants of the world's most ancient peoples. The site remains one of the few areas in the world proven to have sustained extended human activity for over 40 000 years. Zimbabwe has a largely central highveld area, which is commonly known as the Zimbabwe Plateau. It averages at an elevation of around 1 500m. Running roughly northeast to southwest across it is the Great Dyke, a central ridge notable for its wealth of valuable minerals, including gold and diamonds, which continue to be mined along its length. The highveld ridge is belted on both sides by pervasive and progressively sloping middleveld areas averaging just over 1 000m, and culminates in two separate lowveld areas where the lowest elevation is around 150m. These two areas are in the far southern corner, from Gonarezhou National Park to Beitbridge, and in a northeasterly direction all along the Zambezi Valley and around to the northern border with Mozambique. In the north and the northwest, the highveld drops dramatically towards the river valley, forming the Zambezi Escarpment, while in the south, the slope towards the Limpopo is more gradual. The Matobo Hills, at the southern end of the Great Dyke near Bulawayo, form another significant topographical feature. 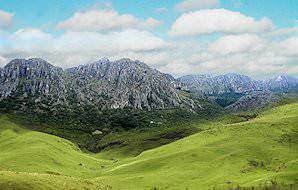 The other defining highland feature of the country is the Eastern Highlands, a narrow, 250km long, north-to-south mountain range in the east of Zimbabwe, occupying the central part of the border with Mozambique and rising to 2 592m at Mount Nyangani in the northern reaches. The world famous Victoria Falls are located at the northwestern tip of the country, while further downstream the Zambezi is dammed at the town of Kariba, forming the massive 200km long Lake Kariba, one of the world's largest man-made lakes and the second largest in Africa. Apart from the Zambezi, a number of smaller rivers rise in the highveld and radiate outwards to irrigate the south and north. The best time for bird watching in Zimbabwe is between October and March, though it has to be pointed out that the temperatures during this time of year can be very high, especially in the Zambezi Valley. Keen birders opting to travel during this time will be richly rewarded, as over 650 species have been identified in the country. Though none endemic to Zimbabwe specifically, eight of the ten families of birds endemic to the African mainland could potentially be spotted. The African Pitta is amongst the rarest of these birds. Areas and parks that are favored by bird watching enthusiasts include the densely wooded Victoria Falls National Park as well as Mana Pools and Hwange. Those who wish to travel off the beaten track will be rewarded by a visit to one of the parks in the eastern highlands, where some unique species can be viewed in the only area in Zimbabwe where temperatures are moderate during the summer months from October to March. Canoeing safaris in Zimbabwe are largely focused around the Zambezi River below the Victoria Falls, and especially the tract of river that flows between the Mana Pools National Park on the Zimbabwean side of the river and the Lower Zambezi National Park on the Zambian side of the Zambezi River. This region offers the adventurous traveler the opportunity to traverse one of Africa's grandest wildernesses on canoe trips ranging from one-day outings to accompanied week-long adventures. The opportunity to view game is unrivaled on any canoeing safari in Africa. Though not as elaborate as some of the mobile safaris available in Botswana, those wishing to enjoy the wild places of Africa on a mobile camping safari have a number of options available to them in Zimbabwe. The most popular national parks for mobile safaris include Hwange and Mana Pools. Both of these parks are easily accessible from the town of Victoria Falls. Hwange is a drive of just over an hour away and Mana Pools is roughly seven and a half hours. These camping trips range from basic, where you will be required to assist with the pitching of tents and other camp duties, to the luxurious, where a team of skilled professionals set up camp prior to guests' arrival with sumptuous meals prepared by chefs and your every need catered to - in the heart of an African wilderness. Whichever option you choose, you are assured of an authentic experience, exceptional game viewing and being immersed in vast African landscapes of pristine beauty. The area surrounding the Victoria Falls is the area in Zimbabwe that offers visitors the greatest diversity of different activities. These range from the leisurely, like sunset cruises, game drives and cultural village tours, to the exhilarating, including white water rafting, elephant-back safaris and bungee jumping. Whatever your persuasion, you are sure to find a host of enjoyable activities available to you when visiting the Victoria Falls. More detail can be viewed on the Victoria Falls page . Fishing the mighty Zambezi for its most worthy adversary, the tiger fish, brings many sportsmen to Zimbabwe each year. Other fish species that draw anglers to Zimbabwe include the red-breasted tilapia, Zambezi tilapia, chessa, nkupe and the eastern bottle nose in the Zambezi River system and Lake Kariba. Those venturing to the eastern highlands can pursue trout in crystal-clear mountain streams, or in a variety of freshwater lakes surrounded by dramatic natural scenery. 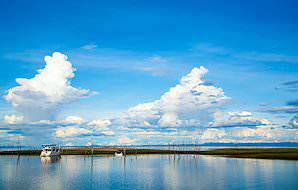 Lake Kariba offers a large number of house boats for hire from the towns of Binga and Kariba, both set on the shores of one of the largest man-made freshwater lakes in the world. Boats of all sizes, from eight to thirty sleepers, can be rented. Here you can enjoy a leisurely vacation cruising the lake, watching various species come to the water's edge for a drink, admiring the many crocodiles and hippos that inhabit these waters, fishing for some of the largest tiger fish in Africa and savoring stunning sunsets over the African wilderness. The Victoria Falls is the world's largest waterfall and inspires awe from all who gaze upon the this eruption of water and spiraling mists. 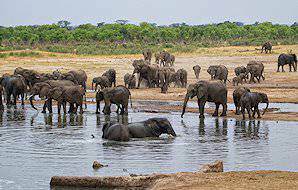 South Luangwa National Park is arguably Zambia's most sought-after wilderness area. Here is where the first walking safaris were conducted.